With the continued rapid growth within the rail industry vehicles of all ages are still being operated across the country. Inevitably due to age, usage, and accidents these vehicles need repairs. 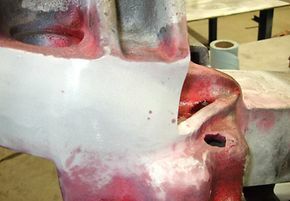 Components also break, wear, corrode, and get damaged through mishap. Spot repairs, large restorations, or full replacements, are needed to the vehicles’ steel or aluminium structures. Due to the age of some vehicles, parts may now be obsolete, or the original build methods are no longer possible. 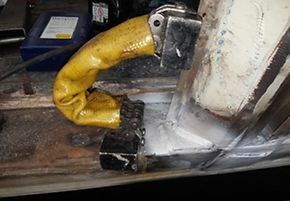 Appropriate welding repair methods can be used to allow components to be reclaimed, and vehicles repaired to the original dimensions and structural integrity. All repair methodologies are specified to maintain the structural compliance and aesthetic requirements of the vehicle. Many of the vehicle repairs could be carried out at operator depots, removing the cost of transportation and speeding up the repair process allowing the vehicle back into service earning revenue. We have staff with more than 40 years of welding experience in numerous welding techniques and welding inspection methods. Our CSWIP certificated engineering capability provides that high level of assurance of a professional permanent solution to your repair requirements. Our customer had some concerns about a radial arm repair that was carried out by a supplier. DB ESG was contracted to create a welding repair procedure and to then approve the supplier‘s conformance to this procedure, auditing the quality of the welding process. This allowed the wear reclamation of cast steel radial castings on Class 221 bogies. This work prevented the scrapping of these bogies, since new castings were not available and new casting of components were uneconomical. DB ESG provided closure of an NIR issue by creating a welding procedure that allowed the lower shelf bracket on the drophead and alliance couplers to be welded to the couplers. 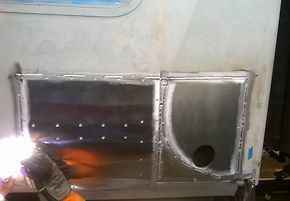 This included technical advice to the repair supplier, auditing of the suppliers use of the procedure and inspection of the welding standards carried out by the supplier. 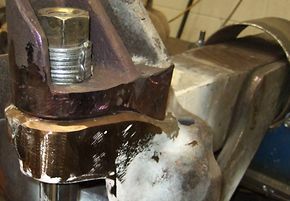 We also provided welding technique training for the supplier as the repair methods had never been previously used on couplers. In many cases damage to vehicles can be increased by having to transport vehicles to repair facilities, which can also be complicated, time consuming and expensive. 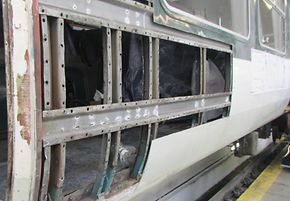 DB ESG has provided complex structural body repair and inspection procedures for both steel and aluminium bodied vehicles, resulting in aesthetic and structurally compliant repairs at customers‘ sites, this reduces costs and ensures that the vehicles are returned to service quickly. In situ Bodyside Repair of an Aluminium Vehicle. 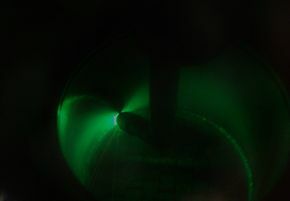 (18) = Structural Door pillar NDT Tested after Repair.